Arni Kleftiko, or Stolen Lamb, from George Calombaris’ Greek Cookery from the Hellenic Heart. is the perfect recipe for a hearty winter’s meal. Although it is reasonably simple to prepare, this dish takes time – allow at least 3 hours cooking time. It is certainly worth the wait but those on high protein/low carb diets should steer clear – this is serious comfort food. 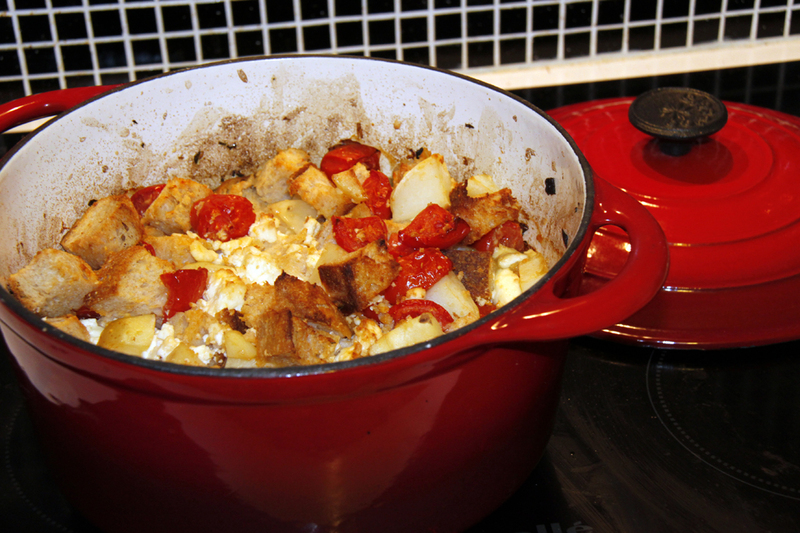 Dice tomatoes, potatoes, onions, bread and lamb into 2cm cubes. This entry was posted in Dinner, Food and tagged Comfort food, Dinner, Food, Greek, Lamb, Slow cooking. Bookmark the permalink. I somehow lost this recipe – thank you so much for putting it online.